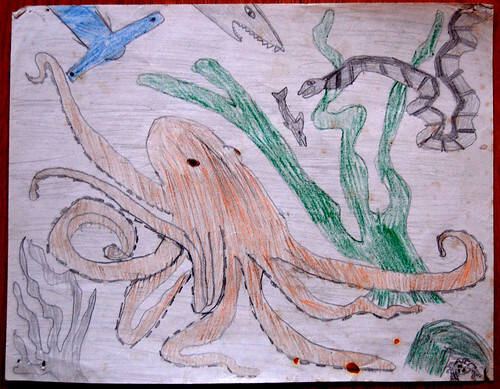 The old Octopus came from his cave and fish swam away. But the great eel waited to become king of the coral old killer the octopus saw the great eel. He darted to one side and attacked a tentackle then old killer turned around and deceided to squeeze the great eel. I in my diving sauser found it Interesting then I saw the two fighting deceided to creep up to them. I slid up behind a big rock or was it? My rock the old giant turtle moved off in to darkness. I had to move quickly now the pirhanas joined in on the fun. The Octopus got a bite and was bleeding he did not give up. The eel was flatter but wide he was struggling. In a few minutes I was behind a large clump of seaweed as two killer whales and some sharks moved in to it. The eel had been devoured and the pirhanas, sharks and Octopus went away.